As we delve more and more deeply into the book of Daniel, we ask You to grant us wisdom and discernment, so that we may understand the meaning of these important prophecies, and so that our study of Your word may guide us closer and closer to You. We have also a more sure word of prophecy; whereunto you do well that you take heed, as to a light that shines in a dark place, until the day dawn, and the day star arise in your hearts. In this lesson, we will continue our study of Bible prophecy, an activity which the Word of God strongly encourages. But before beginning, we suggest you to review the lesson entitled «The Statue of Daniel», in order to correctly understand all the elements which will be explained in this lesson. In the second year of the reign of Nebuchadnezzar, Nebuchadnezzar dreamed dreams. In our lesson «The Statue of Daniel», we saw that Nebuchadnezzar, the king of Babylon, had a dream which greatly impressed him, but whose content he completely forgot. The prophet Daniel, inspired by God, revealed to him the content of his dream: a great statue made of different materials, that was finally destroyed by a stone which became a great mountain. Let’s look at a schematic drawing of the statue the king had seen. This is the dream; and we will tell the interpretation thereof before the king. After having revealed to him the content of his dream, Daniel explained to King Nebuchadnezzar its meaning. The statue represented a succession of universal empires, from Babylon until the end of the world, and the stone becoming a great mountain symbolized the establishment of the eternal kingdom of God at Christ’s second coming. Now, let’s look at the summary of this stunning interpretation. You saw that the stone was cut out of the mountain without hands, and that it broke in pieces the iron, the brass, the clay, the silver, and the gold. The symbol of the stone is often used in the Bible to represent Jesus Christ. The return of Jesus Christ, «the stone cut out of the mountain», will put an end to this world, wiping out all the earthly kingdoms. Jesus Christ (...) is the stone. In the first year of Belshazzar king of Babylon, Daniel had a dream. Many years later, while Belshazzar was the new king of Babylon, Daniel also had a prophetic dream. «I saw in my vision by night, and, behold, the four winds of the heaven strove on the great sea. 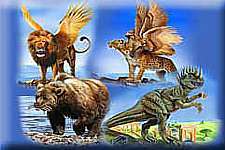 And four great beasts came up from the sea, diverse one from another.» Just as Nebuchadnezzar saw a statue whose succession of metals represented universal kingdoms until the end of the world, Daniel saw a succession of four great beasts, also bearing a prophetic message. First, we see that the beasts are coming up from the sea. Does it mean something? The nations shall rush like the rushing of many waters. The Bible gives its own keys to prophecy: waters represent peoples, nations. Thus the beasts coming up from the sea come from inhabited places. The fourth beast shall be the fourth kingdom on earth. Just like the metals of the statue, the four beasts represent four earthly kingdoms which would succeed one another. Let’s look at these beasts one by one. The first was like a lion, and had eagle’s wings. I beheld till the wings thereof were plucked, and it was lifted up from the earth, and made stand on the feet as a man, and a man’s heart was given to it. The first beast was a lion with eagle’s wings. Which kingdom is symbolized by this description? The king of Babylon (...) shall come up like a lion from the swelling of Jordan to the habitation of the strong. Gold, king of metals, designates the kingdom of Babylon. Likewise, the lion, king of beasts, with eagle’s wings, designates this same kingdom. A great eagle with great wings, long winged (...). I beheld till the wings thereof were plucked, and it was lifted up from the earth, and made stand on the feet as a man, and a man’s heart was given to it. Now, what does this symbolic description of the king of Babylon mean? «And at the end of the days I, Nebuchadnezzar, lifted up my eyes to heaven, and my understanding returned to me.» One day, in spite of Daniel’s warning, Nebuchadnezzar boasted about his power. For this reason, he went out of his mind for seven years, thinking he was an ox. After that time, his understanding returned to him, and he gave glory to God: in this way, his «man’s heart» was given back to him. And behold another beast, a second, like to a bear, and it raised up itself on one side, and it had three ribs in the mouth of it between the teeth of it. And they said thus to it, «Arise, devour much flesh!» Knowing that the lion with eagle’s wings is the kingdom of Babylon, we can easily identify the bear: it is the kingdom of the Medes and the Persians. But why was the bear raised up on one side? Your kingdom is divided, and given to the Medes and Persians. The ram which you saw having two horns are the kings of Media and Persia. In another vision of Daniel, the kings of Media and Persia are symbolized by a ram with two horns, one being higher than the other, meaning the superiority of some in comparison with others (indeed, the Persians were soon to dominate the Medes). This is why the bear was raised up on one side. [The second beast] had three ribs in the mouth of it between the teeth of it. are represented by the three ribs in the bear’s mouth. After this I beheld, and see another, like a leopard, which had on the back of it four wings of a fowl. The beast had also four heads; and dominion was given to it. The third beast is a leopard with four wings and four heads, representing the kingdom which succeeded the Medes and Persians: Greece, whose empire was founded in 331 B.C. by Alexander the Great. What do the four wings and the four heads mean? The answer to this question is found in a second vision of Daniel. The ram which you saw, having two horns, are the kings of Media and Persia. And the rough goat is the king of Grecia. And the great horn that is between his eyes is the first king. In another vision, Daniel saw again the kingdom of the Medes and Persians, symbolized by a ram, and the kingdom of the Greeks, symbolized by a male goat. The large horn of the male goat is the first king of Greece, Alexander the Great. We now understand why the leopard had four wings and four heads. After this I saw in the night visions, and behold a fourth beast, dreadful and terrible, and strong exceedingly. And it had great iron teeth: it devoured and broke in pieces, and stamped the residue with the feet of it. And it was diverse from all the beasts that were before it; and it had ten horns. The fourth kingdom is Rome: the Roman empire succeeded the Greek empire in 168 B.C. Iron is once again associated with Rome: first by the iron legs of the statue, then by a beast with huge iron teeth. The fourth beast shall be the fourth kingdom on earth, which shall be diverse from all kingdoms, and shall devour the whole earth, and shall tread it down, and break it in pieces. And the ten horns out of this kingdom are ten kings that shall arise. Like the ten toes of the statue, the beast had ten horns, symbolizing the ten kings which succeeded Rome. Indeed, as we have already seen, the Roman empire was divided into ten parts in the fifth century A.D. The Heruli, who have since disappeared. The Vandals, who have since disappeared. The Ostrogoths, who have since disappeared. I considered the horns, and, behold, there came up among them another little horn. As the vision draws to a close, an additional detail is given, absent from the vision of the statue: the appearance of a last power, symbolized by a little horn. This power comes up among the ten horns, that is, from the ten nations of Europe. The ten horns out of this kingdom are ten kings that shall arise. And another shall rise after them; and he shall be diverse from the first, and he shall subdue three kings. The little horn will pluck out three of the ten kings. the Ostrogoths, in A.D. 538. He shall speak great words against the Most High. This power, led by a man, would speak pompous words, even against God Himself. It would also have a far more impressive appearance than all the preceding kingdoms. [He] shall wear out the saints of the Most High, and think to change times and laws. Also, this power would persecute «the saints of the Most High», the people desiring to remain faithful to the teachings of the Word of God. Even more, it would try to change the law of God. Then the saints shall be given into his hand for a time and times and half a time. The little horn’s kingdom lasted a time, times (meaning two times, as we will see in a moment), and half a time: in total, 3½ times. = 3½ times, that is, 1260 days. And the woman fled into the wilderness, where she has a place prepared of God, that they should feed her there a thousand two hundred and three score days. This period of 1260 days, also found in Revelation, shows us that the expression «times» really means «two times». Now, according to the prophetic formula «1 day = 1 year» that we saw in the lesson «The Seventy Weeks», these 1260 days represent 1260 years. History teaches us that a power reigned 1260 years, from A.D. 538 to 1798. I have appointed you each day for a year. It came up among the ten nations (Daniel 7:8). It rose after the ten nations, that is, after A.D. 476 (Daniel 7:24). It has a greater appearance than the ten nations (Daniel 7:20). A man sits at its head (eyes like the eyes of a man) (Daniel 7:8). - Ostrogoths, in A.D. 538. It blasphemed against God, speaking pompous words (Daniel 7:8,20,25). It made war against the saints (Daniel 7:21,25). It intended to change times and law (Daniel 7:25). It reigned during exactly 1260 years, from 538 to 1798 (Daniel 7:25). Seek, and you shall find. We will discover the identity of the little horn in a future lesson. Meanwhile, we encourage you to think about it. Do not hesitate to consult history books and encyclopedias: with the help of the identifying marks provided by the Word of God, you will surely discover the identity of the power symbolized by the little horn. And the kingdom and dominion, and the greatness of the kingdom under the whole heaven, shall be given to the people of the saints of the Most High, whose kingdom is an everlasting kingdom. Just like the vision of the statue, the prophecy of Daniel 7 ends happily. God destroys the earthly kingdoms, and establishes His eternal kingdom, for the benefit of those who have accepted His invitation. What a priceless privilege You give us to probe the future through Your inspired Word, and we are grateful to You. As we continue our study, please help us to identify the kingdom symbolized by the little horn, that our understanding of biblical prophecy may be deepened. Above all, we humbly ask You to keep a place for us in Your eternal kingdom, by Your Son’s precious blood which cleanses us from all sin, transforming us day after day into Your image. This is our prayer, in Jesus Christ. The test of Lesson 34 is waiting for you! Header Picture: Picture from the Web site: http://www.pathlights.com/Bible%20School/FB9.htm Screen 1: «Parrot fish eating coral.» In: «Deluxe Compton’s Interactive Encyclopedia CD - 1998 Edition», Compton’s Home Library, 1997. Screen 2: Photo by P. BLEECKX. In: «Le Moniteur», Pacific Press Publishing Association, First Quarter, 1999, front cover. Screen 3: STEEL, John. In: «God Cares, volume 1» (MAXWELL, C.Mervyn), Pacific Press Publishing Association, 1981, p.30. Screen 4: RUDEEN, Herbert. In: «The Bible Story, volume 6» (MAXWELL, Arthur S.), p.28. Used by permission. Copyright ©1955, 1983 by Review and Herald® Publishing Association, USA. All Rights Reserved. Table of Screen 4: HARLAN, Russell. In: «The Bible Story, volume 6» (MAXWELL, Arthur S.), p.16. Used by permission. Copyright ©1955, 1983 by Review and Herald® Publishing Association, USA. All Rights Reserved. Screen 5: MANISCALCO, Joe. In: «Images from the Bible and Sacred History CD», Chosen Works, MLI Software, JM079.BMP. Screen 6: RUDEEN, Herbert. In: «Uncle Arthur’s Bible Book» (MAXWELL, Arthur S.), p.273. Picture edited by Cyberspace Ministry. Used by permission. Copyright ©1945, 1947, 1948, 1949, 1968, 1996 by Review and Herald® Publishing Association, USA. All Rights Reserved. Table of Screen 6: Unknown source. Screen 7: BISHOP, Tom. «Stone strikes feet of image». In: «New Pictoral Aid For Bible Study» (BREADEN, Frank), Australian Division of Seventh-Day Adventists, 1970, chart #7. Screen 8: In: «The Watchtower» magazine (October 1, 1986), New York, Watch Tower Bible and Tract Society, p.1. Screen 9: In: «The Bible Story, volume 6» (MAXWELL, Arthur S.), p.61. Used by permission. Copyright ©1955, 1983 by Review and Herald® Publishing Association, USA. All Rights Reserved. Screen 10: Photo in: «Master Clips 500,000» by IMSI, CD #16, SSGP5445.JPG. Screen 11: BISHOP, Tom. «Lion and bear of Daniel 7» and «Leopard and fourth beast of Daniel 7». In: «New Pictoral Aid For Bible Study» (BREADEN, Frank), Australian Division of Seventh-Day Adventists, 1970, charts #20 and #21. Composite picture by Cyberspace Ministry. Screen 12: BISHOP, Tom. «Lion and bear of Daniel 7». In: «New Pictoral Aid For Bible Study» (BREADEN, Frank), Australian Division of Seventh-Day Adventists, 1970, chart #20. Screen 13: In: «The Bible for Children - Retold by Bridget Hadaway & Jean Atcheson», London, Octopus Books Limited, 1973, p.170,171. Picture edited by Cyberspace Ministry. Screen 14: BISHOP, Tom. «Lion and bear of Daniel 7». In: «New Pictoral Aid For Bible Study» (BREADEN, Frank), Australian Division of Seventh-Day Adventists, 1970, chart #20. Picture edited by Cyberspace Ministry. Screen 15: In: «The Watchtower» magazine (December 1, 1988), Watch Tower Bible and Tract Society, p.10. Screen 16: BISHOP, Tom. «Lion and bear of Daniel 7». In: «New Pictoral Aid For Bible Study» (BREADEN, Frank), Australian Division of Seventh-Day Adventists, 1970, chart #20. Screen 17: BISHOP, Tom. «Ram and he-goat of Daniel 8». In: «New Pictoral Aid For Bible Study» (BREADEN, Frank), Australian Division of Seventh-Day Adventists, 1970, chart #33. Screen 18: Unknown source. Picture edited by Cyberspace Ministry. Screen 19: BISHOP, Tom. «Leopard and fourth beast of Daniel 7». In: «New Pictoral Aid For Bible Study» (BREADEN, Frank), Australian Division of Seventh-Day Adventists, 1970, chart #21. Screen 20: STEEL, John. In: «God Cares, volume 1» (MAXWELL, C.Mervyn), Pacific Press Publishing Association, 1981, p.150. Screen 21: BISHOP, Tom. «Four horns and little horn of Daniel 8». In: «New Pictoral Aid For Bible Study» (BREADEN, Frank), Australian Division of Seventh-Day Adventists, 1970, chart #34. Picture edited by Cyberspace Ministry. Screen 22: BISHOP, Tom. «Leopard and fourth beast of Daniel 7». In: «New Pictoral Aid For Bible Study» (BREADEN, Frank), Australian Division of Seventh-Day Adventists, 1970, chart #21. Screen 23: BISHOP, Tom. «Leopard and fourth beast of Daniel 7 (detail)». In: «New Pictoral Aid For Bible Study» (BREADEN, Frank), Australian Division of Seventh-Day Adventists, 1970, chart #21. Screen 24: BISHOP, Tom. «Map of European kingdoms». In: «New Pictoral Aid For Bible Study» (BREADEN, Frank), Australian Division of Seventh-Day Adventists, 1970, chart #6. Screen 25: Unknown source. Screen 26: CONVERSE, James. In: «God Cares, volume 1» (MAXWELL, C.Mervyn), Pacific Press Publishing Association, 1981, p.108. Picture edited by Cyberspace Ministry. Screen 27: BISHOP, Tom. «Identification of the little horn». In: «New Pictoral Aid For Bible Study» (BREADEN, Frank), Australian Division of Seventh-Day Adventists, 1970, chart #22. Screen 28: Unknown source. Screen 29: «Hourglass and Shadow». Photo from the Web site: www.corbis.com. Image ID: CB007962. Screen 30: BLAKE, William. «The Great Red Dragon and the Woman Clothed with the Sun» (detail), c.1805, National Gallery of Art, Washington, D.C. In: «Revelation - Art of the Apocalypse» (GRUBB, Nancy), Abeville Press Publishers, 1997, p.71. Screen 31: Picture Collection «Corel Gallery Magic» by Corel, 1997, CD #2, CC39.CMX. Picture edited by Cyberspace Ministry. Screen 32: RUDEEN, Herbert. In: «The Bible Story, volume 7» (MAXWELL, Arthur S.), p.26. Used by permission. Copyright ©1956, 1984 by Review and Herald® Publishing Association, USA. All Rights Reserved. Screen 33: BISHOP, Tom. «The New Earth». In: «New Pictoral Aid For Bible Study» (BREADEN, Frank), Australian Division of Seventh-Day Adventists, 1970, chart #12. Screen 34: STEEL, John. In: «God Cares, volume 1» (MAXWELL, C.Mervyn), Pacific Press Publishing Association, 1981, p.106. Picture edited by Cyberspace Ministry. Table of Screen 34: In: HALFORD, John A., «Introduction à la Prophétie», Worldwide Church of God, 1990, p.10. Screen 35: «A lake reflects Mount McKinley in the Alaska Range.» In: «Deluxe Compton’s Interactive Encyclopedia CD - 1998 Edition», Compton’s Home Library, 1997.